Established in 1988 in Fullerton, CA, North South Jewelry is a family owned business which offers custom made modern and classic jewelry manufactured in Los Angeles, CA - one of the jewelry capitals of the world - for every woman to complement her natural beauty and style. Our inspiration lies in offering you a unique personalized experience, getting to know your personal preferences and assisting you in picking out the perfect piece of fine quality, high-end custom jewelry from our eclectic collection of gorgeous rings, earrings, bracelets and pendants – at very affordable prices. "Jewelry Is Like The Perfect Spice - It Always Complements What's Already There"
NORTH SOUTH JEWELRY OFFERS SOME OF THE FINEST QUALITY CUSTOM JEWELRY, AT VERY AFFORDABLE PRICES. In 1985 a young apprentice jeweler began plying his craft in Los Angeles, one of the jewelry capitals of the world. After realizing his talent in creating beautiful jewelry, three years later, in 1988, he opened a jewelry store in Fullerton, CA. 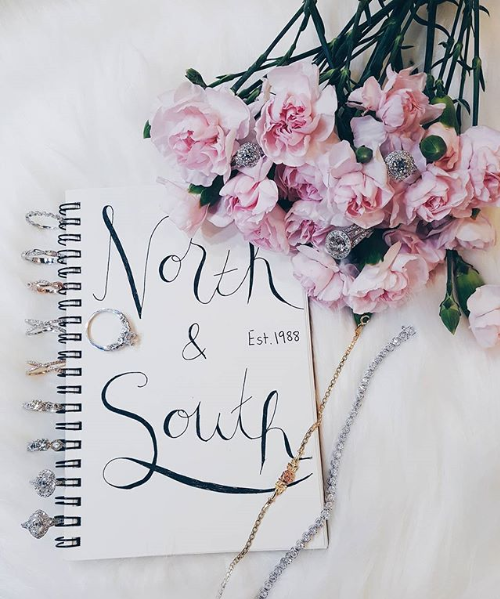 North and South Jewelry was born. His purpose was to share his collection of gracefully hand-crafted jewelry. In Fullerton, CA, a young woman worked diligently to create a store which would give personal attention to every person who came to their booth. From this beginning of caring honest interaction, sprung a wonderful budding jewelry business. Once someone purchased a piece, no matter how big or small, they were "family" and the next time they would come back, they were always met with a smile, and a knowledge of their likes and dislikes, as well as remembering all their family. Share our collection of beautiful, hand-crafted jewelry with the world. Here at North and South Jewelry, we only offer the finest quality hand-crafted jewelry, at very affordable prices. Trust, honesty, care and commitment. We endeavor to bring these qualities to all our interactions and provide the best experience to anyone and everyone.